How do you use evidence in deciding how to protect birds? Most people think that evidence-based decision making is a good idea when managing things that we care about, such as biodiversity. However, there aren’t a lot of guidelines about how to do it well in environmental management, and we know that evidence is not routinely incorporated into conservation decisions. I aim to explore how people draw from an evidence base to inform their decision making in a conservation problem in my research study. Recently while in New Zealand, I visited Zealandia, Wellington’s urban wildlife sanctuary. 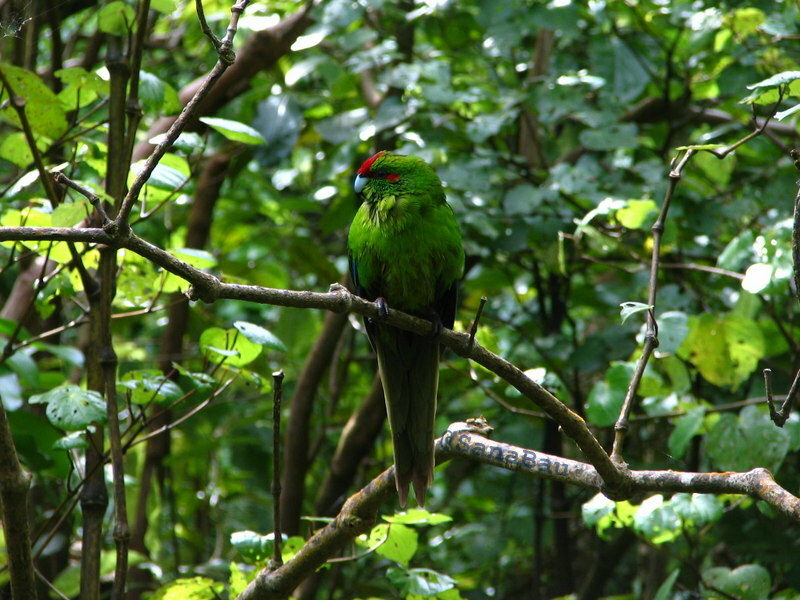 A vibrant kākāriki Cyanoramphus novaezelandiae perches on a branch inside the predator-proof fence at Zealandia. 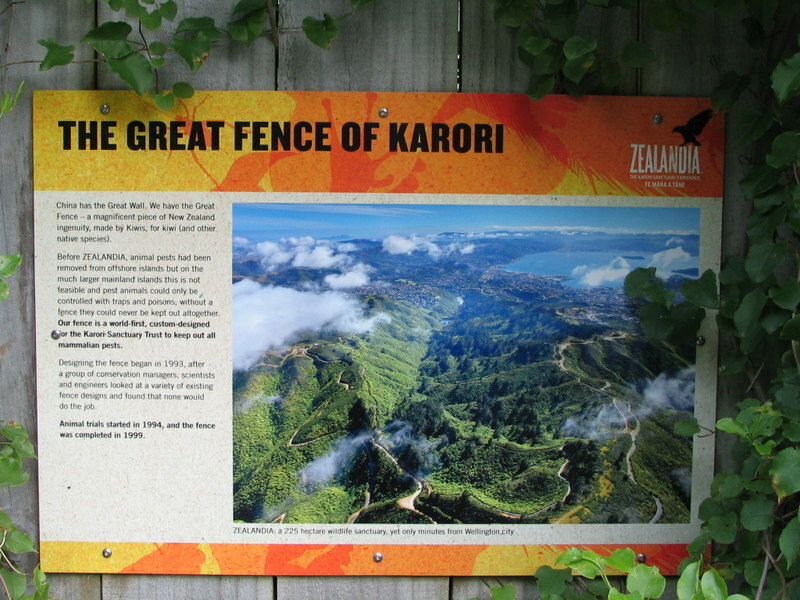 Zealandia is the first facility fully-dedicated to telling New Zealand’s unique conservation story. The Exhibition presents 80 million years of natural history right up to the conservation movement of the present day, with engaging interactive features and a big screen movie. Our beautiful 225ha sanctuary valley provides routes for everyone from wheelchair-users to all-day trampers. You can choose from various fascinating guided tours and feeding talks (all free with admission), or simply roam at your leisure to find our valley’s remarkable native wildlife living free. Display showing aerial view of the sanctuary valley. Everyone knows the old cliché that a picture is worth a thousand words. This simple and elegant visual guide to critical thinking seems to be superior than the equivalent verbal explanation in the quality (more so than quantity) of what it communicates. (Via Guardian/BioBlog). The appropriate use of critical reasoning in decisions under uncertainty is no small obsession of mine, and I probably couldn’t have made a clearer argument than presented in the above figure in substantially more than 1000 words. Also, I’ve finally been persuaded to join the Twitter community on recommendations of QAEco colleagues, including this post by my supervisor @mickresearch. This argument by Happy Science, also via Mick’s blog had me at “Interested in science communication and public engagement? You NEED to be on Twitter”. …and welcome to my blog! I have recently joined the Quantitative and Applied Ecology Group at the University of Melbourne’s School of Botany. This website will be a communication point for news relating to my research: projects, publications, presentations and more. Despite the “Botany” affiliation, I am principally immersed in integrative, big-picture thinking squarely targeted at complex environmental problems. My set of interests straddle the gulf that traditionally divides quantitative and qualitative modes of enquiry, and I am particularly interested in conflicts between science and policy/management in practice. I think that the rise of unprecedented global change requires innovative, eyes-wide-open, critical-faculties-thoroughly-intact responses to the challenges we face, that may fly in the face of convention, prescriptive scientific application and dogmatic adherence to disciplinary boundaries. Given that it’s early days and (for now) this blog is strikingly devoid of content, I shall endeavour to populate this space with regular updates on my activities. In the meantime, if you are interested in my work, feel free to contact me. I’d love to hear from you.